This scenario is a direct sequel to #1-00: Salvation's End, and also has ties to #1-05: First Mandate. It continues with #1-20: Duskmire Accord 9. This adventure is populated with a ton of entertaining characters. From the crew, to Zo!, and the people met while exploring Salvation, this is a scenario that’s overflowing with fun, engaging, social encounters. It’s full of personality, and I guarantee you’ve never played anything like it before. Aside from the wonderful ‘reality t.v.’ schtick it’s got going for it, the adventure itself -– the things you find in Salvation -– are really, really surprising. This scenario does an awesome job of playing up the quirky reality tv experience, including pulling characters aside to ask prying questions, and having the studio audience vote on how some situations should play out. It's a blast! I cannot express how much I loved this scenario. One of my favourites, for sure! I just GM'd this at SCARAB 2019 and it was a lot of fun. The players had a great time - especially with the role playing part! It definitely helps if you have good improvisational skills - and a bit of a sense of humor to pull it off as a GM. The flavor of this "reality show" scenario reminded me a lot of how the old Paranoia games would be completely unpredictable. John Compton definitely did a great job writing this one. Live Exploration Extreme! is an awesome, zany concept with fantastic potential... but one that relies on PCs and a GM that are willing to lean into the absurdity and let loose! The PCs are off to investigate the mysterious moon of Salvation's End once more, but this time with a live studio audience in tow! Turns out Zo! has gotten the rights to televise the next Starfinder Society mission into the interior of the moon and he's determined to make it as dramatic as possible. The PCs descend into the moon, but what awaits them there... and is it real, or just part of the show? Obviously, it's not perfect. It relies more than most scenarios on having a skilled GM that is good at improvising. The PDF has errors and layout issues that make an already complex scenario more challenging to run. But even considering these issues, its simply a funny and memorable romp that I'd definitely recommend. Just make sure to bring a character that isn't *too* serious. If the scenario has any weaknesses, one is certainly that it doesn't gel well with characters who want to stick to the mission and avoid the limelight. The concept is absolutely zany. Undead crew members toting cameras! A live twitter feed commenting on the PC's adventure! The Booth! This is nothing like any other SFS mission. The pre-Gap dwarves are a real mystery, intriguing the players. Lots of opportunity to RP, both with fellow PCs and with the NPCs. The layout of the PDF is a nightmare. Information is all over the place. Maps and character portraits are nowhere near the related text. The fan favor mechanics are really complicated to understand, to adjudicate fairly, and they ultimately don't amount to much. Tracking them on a per-character basis along with each character's persona, while running a bunch more stuff is tricky for the GM. There's a lot of 'reactive' content, which asks GMs to improv based on the PCs actions thus far. Great if you have an inventive, experienced and engaged GM, terrible if you don't. A GM that half-asses the Booth, doesn't have anything interesting on the twitter feed, and never does anything with the camera crew will inadvertently cut out half the fun of the scenario. In more structured scenarios, this doesn't happen nearly as much or as severely. Railroady. Out of necessity, but the chain of events here doesn't leave almost anything up to PCs despite this being a very open ended seeming scenario. Wazasha is set to keep PCs in line. A very fun scenario, with a good mystery, a lot of flavor & humor, of different types. A very moving story of the NPC group you'll meet, and a super fun & annoying aspect from the ones' accompanying you. With great hooks for further adventures! I ran it last weekend, it was a lot of fun. My players did seem to get into it. It was fun to play the Camera Crew as annoying as possible. I had the head Camera Man named Micheal Bay. One of my players even did the Michael Bay "Model running through the explosions" scene for the camera crew. Honestly one needs more than four hours to run it. We ran really late, and the Roleplay in the later half suffered since we were all tired (we are a group of players in their 30s and 40s, so we do not handle staying up later as well as we used to ) I really should of skipped the optional encounter or modified that encounter some way that would have been quicker and provided some continuity at the same time. Despite what others say, Combat still drags in Pathfinder/Starfinder, even though I realize running long is normal for a Role Play Intensive scenario. But all in all, it was one of the best-written scenarios I have seen and run in a long time and would run it again. I give the scenario five stars. Several of my players with the icon theme on their characters should love this one! Is that how this works? Huh. Time to press some random buttons. Oh, I am looking forward to Gming this one. It looks like an utter delight! This is one of the best scenario blurbs I have ever read. I can't wait to see how this one comes out. John and Thursty, you know you guys are distracting me in my march to 5 star? I’ll never get there by Paizo Con, if you keep tempting me with such delicious SFS scenarios. Aaaaarrgh! So let me get this straight: The Eoxians have reality shows? I am so looking forward to this scenario! But first a word from our sponsors. Are you tired of your enemies getting the drop on you? DrowTek has you covered with the latest in advanced cloaking technology that will give you the edge against friend and foes alike. Starfinder was filmed in front of a living-impaired studio audience in orbit. I just hope I get to ask them pesky questions in between fights. Keeping up with the Eoxians! Oh, good, something new to watch. I haven't found a good show to binge after Eoxian Idol went downhill in Season 7. So...they really are the most evil race in the Starfinder Universe. Any Scenario Tags for this one? What maps will this call for? I.e. Do I need to order any Pathfinder maps? I really want to see this played live over twitch, with John as GM and (ideally) Thursty as a player. And I want actual people watching the livestream to be able to act as the reality TV orbiting audience in some way. You've got several weeks. MAKE THIS HAPPEN!!!!! So since it has been pushed back a month, any chance we can get it to be 3-6 instead of 1-4? Those that played the First Mandate would really like a chance to play it. With 10 modules and two story arcs avialable, many people will have leveled out of range. Even with the delay, the ability to change this scenario's Tier is entirely improbable with the time left. Also, as we've learned with Pathfinder Society, we want to keep a strong number of Tier 1-4 scenarios available at launch, to ensure that new players always have a chance to get a game in. If your concern is with regards to the Chronicle sheet bonus provided from this scenario, no worries. We'll be using that specific boon (and this specific NPC) in various different situations. So this won't be a "one and done" use of the influence boons. Thanks for the response. REALLY looking forward to the module. Please by released in time for Con of the North. I scheduled to run this one multiple times. 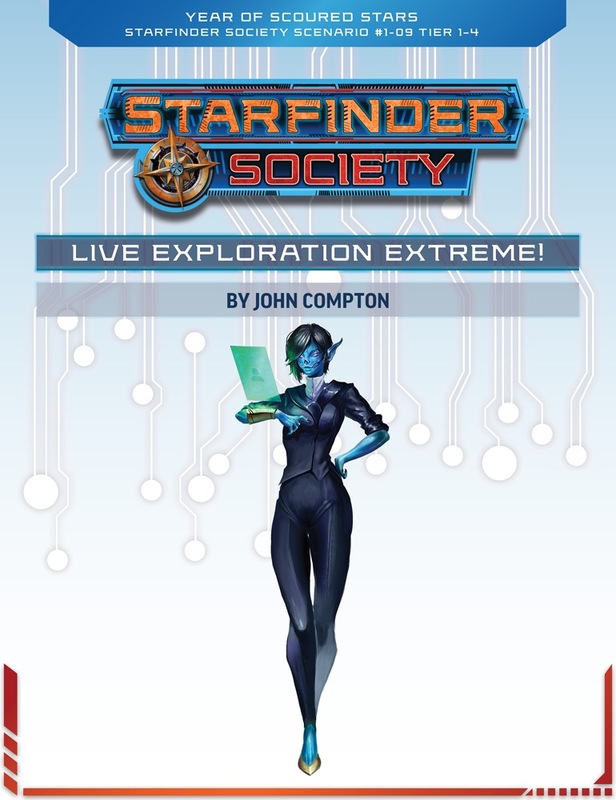 No scenario tags on this one, though it's suggested the PCs have played Starfinder Society #1–00: Claim to Salvation, first! As for Con of the North, I believe this scenario is scheduled to be released shortly after that event, due to our reshuffling of this and Sanctuary of Drowned Delight. Sorry for the inconvenience! Hello Thurston--Is the "Elemental Dungeon Multi-Pack" you listed the "Elemental Planes Multi-Pack"? Yes, apparently I am now one of those people who buys flip-mats just because they're coming up in an upcoming SFS scenario . . . Yes, it should, be the Pathfinder Flip-Mat: Elemental Planes Multi-Pack, specifically the Earthy section. ZO! 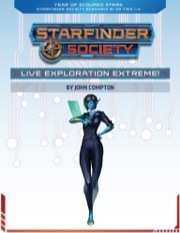 Signed a group of explorers for dancing with the starfinders, extreme sudden death edition. Can't wait to GM it! Seriously, this takes everything I loved about X-Crawl, got rid of the 'meh' bits, then made it all 110% cooler. Erm. I mean. This looks very nice. You realize that you can bring the Salvation's End chronicle sheet even if it's not assigned to that Icon and garner the benefit from it, right? Says so right on the Chronicle sheet. I'm totally new to Pathfinder/Starfinder, and to organized play in general, and I'm interested in trying Starfinder in particular because it's still in its first season and I'm kind of a completionist, but with this specific scenario being a sequel it doesn't really seem like an ideal jumping on point. If I skip it for now, am I likely to find opportunities to play 1-00 to catch up and then play this one in the future, or should I just look for standalones to play and new plots to begin and not worry about this one? Star finder in particular, thus far, has been phenomenal at alluding to future scenarios with past ones. I would not suggest starting with this one. Opportunities for play depend heavily one where and with whom you play so, can't give advice there. I'd check out your local Society branch for play opportunities and activity. Usually the Venture Captains are running a facebook group where they announce all the public scenarios. I'll probably play this without having played 1-00 but my character knows Zo! from First Mandate as well. This is purchased but is not showing up in my downloads? I've just posted my full review, but I'll add my plea for more reality show action. I hope the reporting conditions persuade Luwazi to undertake more joint ventures with Zo!